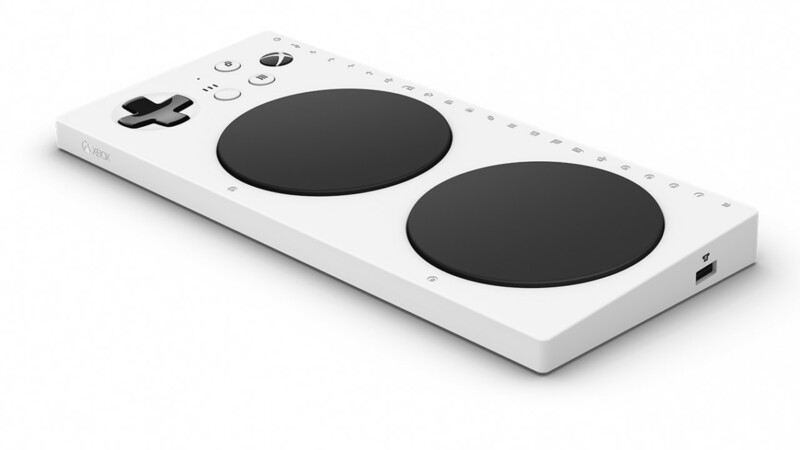 The Xbox Adaptive Controller is a special Xbox One console controller developed by Microsoft specifically for the needs of players with reduced mobility. This unique product is not just a controller, it is also a unified hub that facilitates and improves the gaming experience. Thanks to a series of 3.5 mm jack connectors and USB ports, users will be able to connect external devices such as switches, buttons, mountings and joysticks. In this way, people will be able to fully customize their gaming experience. To create the Xbox Adaptive Controller, Microsoft has worked side by side with The AbleGamers Charity, Cerebral Palsy Foundation, SpecialEffect and Warfighter Engaged to create a controller that could allow those with some physical limitations to still be able to enjoy Xbox One. Though designed especially for consoles, the Xbox Adaptive Controller also works quietly on Windows 10 PCs to allow people with disabilities to have fun even on their home computers. Microsoft has worked hard on sales packaging. Being a product destined to end up in the hands of those who may have some mobility problems, the Redmond Company has developed a package that is as easy as possible to open. Nothing has been left to chance. A comfortable tongue that can be pulled effortlessly with two simple fingers allows the box to be easily opened. The interior is perfectly organized. Everything is handled to the maximum with two fingers to allow you to quickly pull the controller and cable out of the box. Furthermore there are no “flying leaflets”. Instructions are on the controller’s cardboard cover. A pack that shows how Microsoft really paid attention to the smallest details. 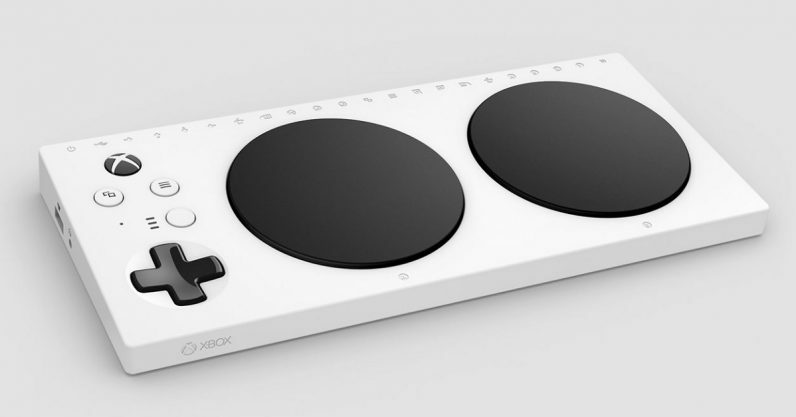 The Xbox Adaptive Controller is very different from the classic Xbox One console controller. Flat, it was designed to be able to rest easily on flat surfaces. On the lower part there are connections dedicated to different types of supports so that the controller can be positioned almost anywhere, even on tripods. On the front side there are several 3.5 mm jack connectors for connecting external accessories. The USB ports are located on the sides. Very particular the upper part of the controller where there are two large buttons that simulate the B and A keys of the controller. Also present additional buttons and the classic cross-shaped d-pad of canonical controllers. All this is absolutely customizable according to your needs. To remap the keys you need to use the Xbox Accessories app on Xbox One or Windows 10. Xbox Adaptive Controller is already on sale. You can buy it on the Microsoft Store at a price of 89.99 dollars. What is immediately striking is the packaging. Microsoft has really done a great job in making a box that can open with two fingers. Moreover, the target of this product is very clear and the Redmond house could not overlook the appearance of the package. Xbox Adaptive Controller is a solid and well-built product. Already at the touch it is clear that the controller is made in a workmanlike manner. It is not too light and not too heavy and on a smooth surface like a table it is always very stable. Furthermore, the screw connections of various sizes placed on the lower side allow to connect it solidly to any type of top or support. In this way users will always be able to dispose of them in front of them regardless of their motor disabilities. 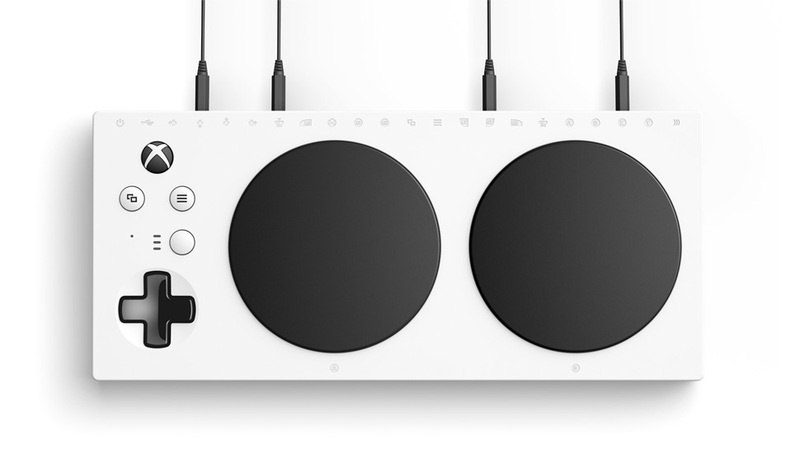 The Xbox Adaptive Controller can be connected to the console or to a Windows 10 PC either via Bluetooth or via the supplied USB-C-USB cable. Microsoft lets you customize command mapping through the Xbox Accessories app. Users will also be able to create different profiles based on their needs or if the controller is used by more than one person. 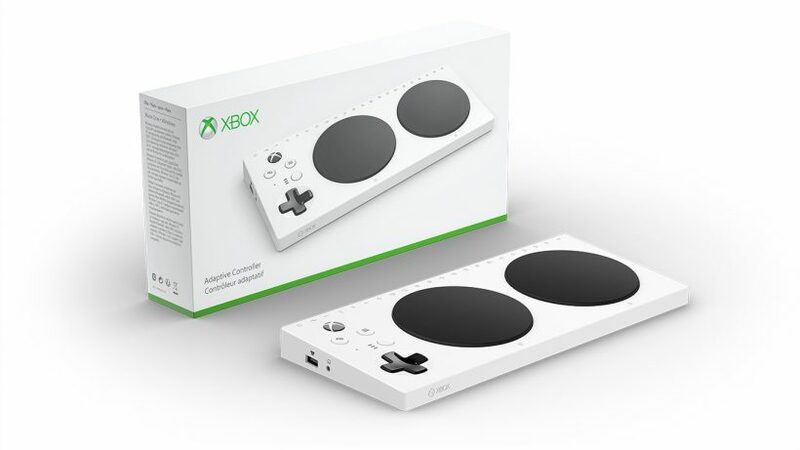 The two large buttons that simulate the B and A buttons on the controller, the classic cross-shaped d-pad and the other buttons typical of Xbox controllers are easily used with the Xbox Adaptive Controller resting on a flat surface. Even with limited hand movements it will be possible to reach and manage all the controls. But the true potential of the Xbox Adaptive Controller is expressed when it is used as a real hub to manage multiple gaming devices. You can connect a bit of everything to the 3.5 mm jack connectors (19 in total) or to the USB sockets (two USB 2.0). Joysticks, buttons and everything you need to play in the best ways can be connected to this device. And always thanks to the Xbox Accessories app you can configure everything. A controller that makes the gaming world accessible even to those who suffer from certain motor limitations. A product that is offered at a particularly attractive price. The approximately 90 dollars needed for the purchase are right for the quality offered.